This extremely swift 27ft Shamrock Express powered by a 270HP Cummins engine fishes out of Los Sueños Marina in Playa Herradura. Skippered by Captain Javier, she offers the latest in electronics including two Furuno GPS, furuno color sounder, 24-mile radar, two VHF radios, abundant shade, plus a head in the V-berth. 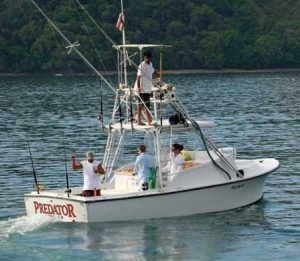 It carries a full range of Penn International and Okuna lite tackle: 20, 30 and 50lb test (if you want to fish on lighter test, bring your own reels with your preferences), Penn spinners, Lee outriggers, Penn downrigger, tuna tubes and a live bait well, plus all the required safety equipment.